Jordin Canada did her best to help get the Bruins past the Beavers in Saturday’s Pac 12 Tournament semifinal. She had 27 points. Photo by Mike Houston/T.G.Sportstv1. 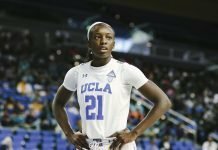 Jordan Canada did everything she possibly could to help UCLA against the No. 1 seeded Oregon State Beavers in Saturday’s Pac 12 Tournament semifinal match up. But despite scoring a game-high 27 points and leading the Bruins to a 30-27 half-time lead, it wasn’t quite enough to pull off the win. Not only did Canada lead her team in scoring, but she played with incredible defensive intensity throughout the entire game, making life difficult for Beaver star guard Sydney Wiese. Canada forced Wiese into six turnovers and limited her scoring for most of the second and third quarters. UCLA Coach Cori Close felt like she might have put too much responsibility on Canada, which might have led to her wearing down in the second half. While it wasn’t easy, WIese did lead the Beavers in scoring for a second consecutive tournament game. Wiese had 19 points, but it was more about when and how she got them. 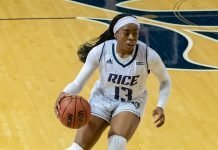 The senior came through in the clutch, scoring eight of her points in the final three minutes of the game; including back-to-back three-pointers to seal the win. Wiese has come to expect this from her veteran team. Wiese also got the loudest cheer from the crowd all night, when she raced down the court and used a perfect spin move to juke the defender to free herself for the open layup just before half-time. Oregon State is known for their dominating size. And Marie Gulich had a huge impact on this game. Gulich was the only player to record a double-double in the game. She had 11 points and a career high 16 rebounds. She played a large role in Oregon State out-rebounding the Bruins 50-31. 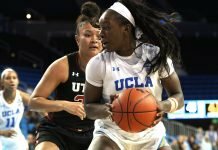 A big part of that was shutting down UCLA’s prolific forward, Monique Billings. Erica McCall was instrumental in guiding the Cardinal to the Pac 12 Tournament Final. Photo by Rahim Ullah. 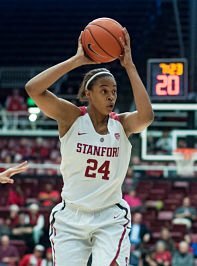 While Stanford’s lockdown defense was the true star of the night for the Cardinal, the team got great contributions from several key players. But none more impressive than the post play of Erica McCall and Kaylee Johnson. Both players recorded double-doubles, with McCall leading the team in both scoring and rebounding with 17 and 15, respectively. She also had four blocked shots. McCall was tenacious around the offensive glass all game long, grabbing eight offensive rebounds. At one point she grabbed the offensive rebound over multiple Oregon defenders and laid it back up while getting fouled for the three-point play. She rightfully flexed her muscles to the crowd after that one. Post-game, the media compared McCall’s effort to that of former Stanford great Chiney Ogwumike. McCall echoed that she has tried to mimic her game after the Connecticut Sun star. Meanwhile, Johnson seemed to be the answer any time Oregon tried to make a run to get back into the game. Whether that was knocking down a mid-range shot or playing stout defense and getting a block or a stop and rebound. Cardinal coach Tara Vanderveer praised the impact of Johnson in this game and since she’s returned to the team. While the Ducks struggled to score in this game after the first quarter. Their bright spot was freshman standout Sabrina Ionsecu, who continues to shine. She led the team with 14 points on 50 percent shooting and 2-3 from three point range. For the Ducks, this was a good learning experience, and something the young team will be able to take with them as they head to NCAA play.